Birthplace : Coeur D'Alene, Idaho, U.S.
Pappy Boyington was a United States Marine Corps officer who was an American fighter ace during World War II. For his heroic actions, he was awarded both the Medal of Honor and the Navy Cross. 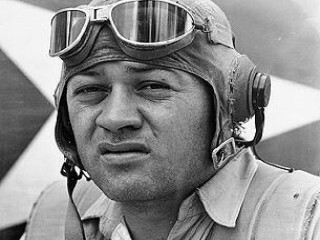 Gregory "Pappy" Boyington won the Congressional Medal of Honor in World War II, when as a Marine pilot he was credited with downing 28 Japanese aircraft. For three months in 1943-44 he led Marine Fighting Squadron #214, the so-called "Black Sheep Squadron," in the Solomon Islands. During that time the squadron was credited with 97 confirmed kills of enemy aircraft. In January 1944 Boyington was shot down and captured by the Japanese and spent the rest of the war as a prisoner. Boyington's autobiography, titled Baa Baa Black Sheep, was a bestseller in 1958. In the 1970s a television series by the same name ran for two seasons on the NBC network, with actor Robert Conrad playing Boyington. Boyington got the nickname "Pappy" because, being just over 30, he was a decade older than many of his pilots... Boyington was known as Greg Hallenbeck while attending the University of Washington. According to a feature in the school's alumni magazine, Boyington "was using the name of his step-father and did not revert to his father's last name until after graduation."